Who does not love a healthy addiction? I can't say I am really addicted to anything. My husband may say my iPhone, and goji berries but not many things are out of my control. Well, darnit, I ordered this chocolate and now its almost gone! I am addicted to the amazing raw chocolate from Addictive Wellness!!! I met the owners in April at the Longevity Conference put on by David Wolfe. Sage was working with us at the Tonic bar and his beautiful better half Anna Blanca, was hustling her little tail off getting this chocolate into everyones hands that would take it, and why would't you take it? I only tried one piece and said I would take some home, and never did! As I follow Sage and Anna on Facebook and instagram I realize what amazing people they are. They not only have an wonderful product but they are full of love. Let's take note, their logo has a unicorn in it, how much more magic do you need after a unicorn? :) What I find in people who are full of love and create edibles, is you feel the love when you eat it. So I had to order!!! I bought the multi pack so I could try each kind, Tranquility, Energy, and Beauty. 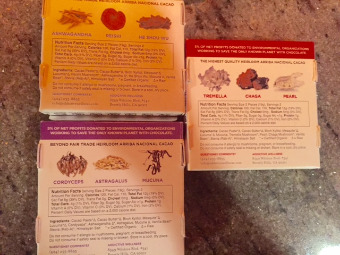 I am very familiar with superfoods, but I am working on my super herbs and medicinal mushroom knowledge. These three are packed with the above, but free of all things, that typically ruin chocolate: Gluten, nuts, sugar, dairy, soy, gmo, and trans fat.. I can not pick one as my favorite and only one remains of each,because I am passing them on to a friend. Full of nutrition, herbs, amazing fat, non gas forming birch Xylitol, and love, it is a chocolate you could eat a lot of and not feel guilty. I am always a fan of great nutrition and pleasurable eating going hand in hand. Addictive Wellness is just that and I am grateful and eager to share it with you! So hop on Amazon, or their website and buy, you will not be disappointed.